With 21% of Americans listening to at least one podcast per month nowadays, podcasts have truly arrived as a popular broadcasting medium. And one of the great things about this growing popularity is how it’s opened the doors for all kinds of niche podcast topics that would never have worked on terrestrial radio. As you might have guessed from this post’s title, these niches include some excellent web design podcasts, which I’ll be listing out in this post. Keep reading to discover 15 web design podcasts you should consider adding to your listening queue. Before I dig into all of the best web design podcasts, I’d like to give you some insights into how I built this list. First, I read a variety of posts on web designers’ favorite podcasts. Then, I tried to find an objective measure of a podcast’s quality/popularity. Because download numbers aren’t publicly available, I relied mainly on iTunes’ ratings as well as any other public metrics that I could find. I also made sure that, at least at the time of writing this list, all of the featured podcasts are still actively publishing new episodes on at least a semi-regular schedule. The best web design podcasts for you to queue up, learn from, and enjoy. Winner of the 2015 Net Awards, The Web Ahead podcast takes a deep look at developing technologies and the future of the Internet. Whether it’s taking web design head on or focusing on tangential topics like DRM, The Web Ahead is a worthy addition to your queue. With 3.1 million downloads over its 117 episodes, other web designers agree! Though its description says weekly episodes, they generally release one or two new episodes per month according to their release schedule over the past few months. If you’re strapped for time, Developer Tea is a popular developer podcast delivered in bite-sized segments. All of their episodes are ten minutes or less, which makes them easy to fit into your coffee (or tea!) breaks. They do focus on both software and web development, so it’s not exclusively a web design podcast. You may need to pick and choose the topics you listen to. 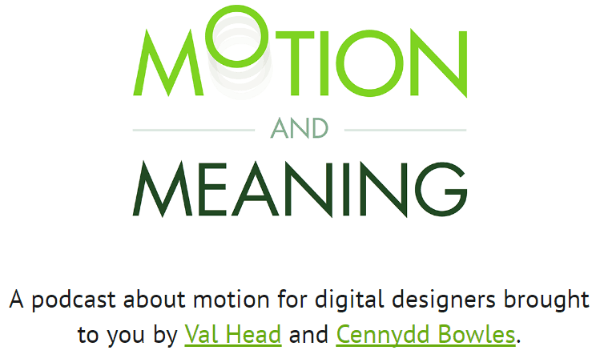 Motion and Meaning is a podcast from Val Head and Cennydd Bowles focused on how designers can use motion to enhance their designs. The first season included ten episodes of around 30 minutes each. At the time of writing this post, Motion and Meaning is two episodes into its second season. You may be able to infer this from the podcast title, but Responsive Web Design Podcast is all about responsive web design. The podcast tackles this subject by interviewing the people behind responsive redesigns. For example, in their latest episode, they interviewed the two designers behind Edmonton city’s website redesign. They’ve recently passed the 100 episode mark with no signs of slowing down. You can expect a new episode every single week. Toolsday is less concerned with the conceptual and more concerned with practicality. Each week frontend developers Chris Dhanaraj and Una Kravets dig into the latest tech tools and tricks. Whether it’s streamlining your development process or making you a healthier person, Chris and Una will probably talk about it. New episodes release every Tuesday (get it?!). 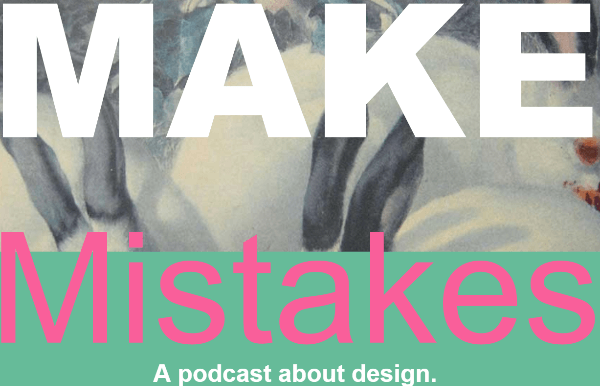 Coming to you from Mule Design, Let’s Make Mistakes is a podcast all about design. Sometimes it’s just the in-house Mule Design team and sometimes they bring in outside sources to interview about topics like designers learning to code, how music relates to design, and more. Though there’s no coherent publishing schedule, Let’s Make Mistakes is a nice addition to your queue. 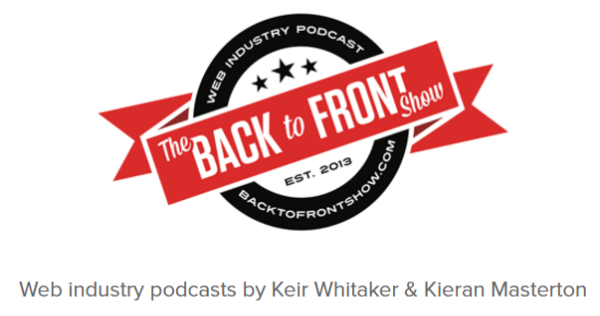 Started in 2013, The Back to Front Show covers everything from web design to remote working to “hipster beards.” Each episode lasts about 40 minutes. Though it doesn’t have a set publishing schedule, you can expect about one new episode per month. Design Review is a podcast from Chris Liu and Jonathan Shariat. Each episode examines a single product or topic. For example, past episodes have discussed topics like the design/UX of Pokemon Go and polite vs impolite software. Though the tagline says it’s a weekly podcast, Design Review currently on publishes about one episode per month. The Boagworld UX Show is a ~weekly podcast covering topics ranging from web design and usability to marketing and strategy. With over 380 podcast episodes, it’s one of the longest running web design podcasts out there. Each episode runs about one hour. The Creative Coding Podcast covers all aspects of programming for creative applications. Over their 70+ episodes, they’ve interviewed people like Val Head (of Motion and Meaning) and talked about VR headsets. They normally release a few episodes every month. If you’re a freelance designer, Design Life is especially suited for you. It’s hosted by Charli Marie and Femke van Schoonhoven who are both full-time designers moonlighting as freelancers. Covering everything from design to side hustles, Design Life releases new episodes every week. Around since 2006, UXpod focuses on web design and web usability topics. Though topics can sometimes be eclectic, UXpod tries to stick to these themes. You can generally expect one to two episodes per month, though the podcast has gone on multi-month hiatuses before. Delving into the world of interaction design, the Radio Johnny podcast focuses on topics like Digital UX and psychology. Whether it’s theory or practice, Radio Johnny has something to offer web designers. You can usually hear one or two new episodes per month. Between drinking, these software engineers cover all aspects of front-end web development. As you might expect, the show is a little more loosely structured than some of the other podcasts on this list. Front End Happy Hour usually releases about two new episodes per month. Design Details is a “show about the people who design our favorite products.” Hosts Bryn Jackson and Brian Lovin take you through a new product every week. Each episode features a guest designer who shares their insights into the world of design. Add these web design podcasts to your favorite podcast app and give them a listen! Whether you’re driving to work or in the shower, podcasts are a great way to pass the time while still learning something new. Now it’s your turn. It’s a big wide world out there and most podcast sites don’t have a dedicated web design category. Did I miss your favorite web design podcast? It would be great if you shared any noteworthy podcasts in the comments. I checked some of them to add to my podcast list. It seems “The Web Ahead” is inactive and ‘Radio Johnny’ is retired. Already subscribed to couple of these, DesignReview & Toolsday on Pocket Casts Android app. Now I get to know more. Thanks. PS: While every single podcast listed above is free, should the element of Price still be there? Just saying. I just came across the WP Innovator Podcast with Lee Jackson – and I love it. Especially relevant for WordPress Users, agencies and freelancers. Great content and an entertaining host, I highly recommend it. Excellent list. I’ll have to look into adding some of these. I just recently started listening to the group over at Divi Chat. And ironically, one of their recent episodes actually covered Design Principles within Divi… http://divi.chat/ep05-effective-design-principles-divi/ (not sure if this link will show up or not). Was kinda cool to get Divi specific info. Wonderful list, I found this much helpful. Thanks for such post and keep it up.